Renters insurance is great protection for not just the tenant but also the landlord. You may think that since you have home insurance, it would cover rented property as well but it might lead to conflicts with your insurance company and may have complications for you as well. Renters insurance can give the landlord the peace of mind that regardless of what happens inside the rented property, the tenants would have a cover that they can use. There are a number of benefits of making renters insurance a necessary requirement in the lease agreement. 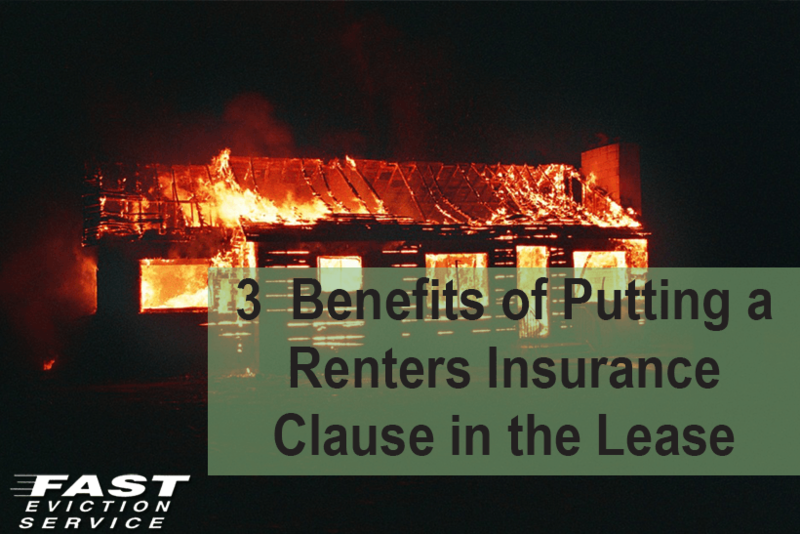 This means that any tenant not having renters insurance would be in violation of the lease. You may think that putting such a clause in the lease may scare away many possible tenants since it would prove an extra burden on them. However, after seeing the benefits of renters insurance, you would realize that waiting for the tenant who has renters insurance or is ready to purchase it would be the right decision to make. Lawsuits become a probability in case something happens in the rented house. Whether it is the tenant who faces damage and wants the landlord to take responsibility or a guest in the house who gets injured and wants payment for damages from the landlord, you would be the one who will get in trouble. In the case that your insurance agrees to pay, you can be assured that the premium would only get higher after such an episode. If your tenant will have renters insurance, you would have nothing to worry about in such circumstances. You won’t want tenants who are already broke and simply can’t afford a simple $20 per month renters insurance. If you ask for renters insurance and a tenant simply tells you that he/she won’t take it because it would be too huge a burden, it should serve as a red flag for you. It may either be that the tenant is basically broke and may find it hard to pay the rent on time or it may be that the tenant simply wants to get you involved in case of any problems inside the property. In any case, you would stay away from such tenants by making renters insurance necessary. Peace of mind is of so much value even though it has no worth on paper. The knowledge that you wouldn’t be responsible for paying in case of any damage to the tenant or the property during the tenancy can take a lot of burden off your shoulders.